When I was in Kemaman Base, I was desperately applying for any job in KL. I just want to be nearer to my husband. One of the options was quitting my job and applying full time postgraduate studies. So I applied Master of Engineering in Mechanical in addition to my BEng. To my surprise, I get accepted to University of Malaya! one of the top engineering school in Malaysia. Alhamdulillah. Alhamdulillah. Alhamdulillah. Fulltime Master of Mechanical Engineering by course work. But now, I am here, in SK HQ and in doubt. Should I continue my study or just stay with my current job? My friends suggested to register first. 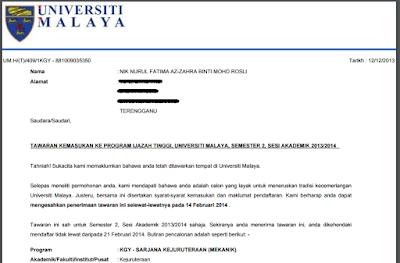 They told me that it is hard to get accepted to UM especially for MEng. However, my husband told me to hold it. He wants me to continue Master with him. Told me to have stable job first as I just started my work in HQ. I might be going to offshore or outstation in the near future, and that will affect me if I continue my studies even for part time. p/s: I never applied for SPA (?) aka government servant as I NEVER attracted working with the gov.